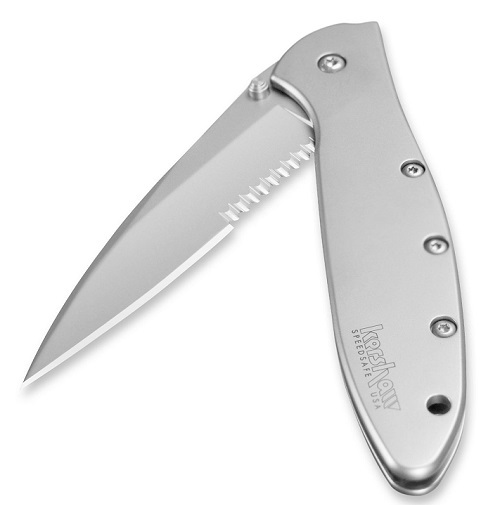 Kershaw 1660 Leek Ken Onion folding knife is one of the most ambidextrous pocket knife available online with faster and safer functionality. Whether out in the wild or in the kitchen, you are as efficient as your tools permit you to be. For a fishing enthusiast like me, who also likes to clean and cook her own catch, you can understand just how important it was for me to locate the very best that there is concerning an all-purpose knife. I have a collection of a variety of knife sets and yet, I had to review the Kershaw 1660 Ken Onion Leek with SpeedSafe, for the simple reason that it impressed me. Kershaw knives have been in the market with high quality knives since 1974. The company has also witnessed a transition in 1977 when a Japanese company The KAI group acquired it. Yet, the influence of designer Ken Onion has been paramount in the enviable success of the company. His designs have been producing award winning products- Boa 1580 and the Black Chive 1600BLK are just some instances. He has introduced the SpeedSafe system, which is an added feature that keeps my fishing sprees, and kitchen endeavors a little bit safer. The feature allows me to be able to open the knife by just pushing on the thumb stud or by pulling the protrusion on the blade. While I have been experimenting with fishing and cooking for quite some while, I am in no way a professional expert in any of these areas. However, my personal experience with the knife has been quite efficient and suitably impressed. However, you will find that the Leek series in general has been widely accepted by professional chefs and expert hunting and fishing enthusiasts. The very simple fact that the series combines the SpeedSafe feature of Kershaw knives with the enhanced performance of a versatile tool- makes it such a great seller. The product has an average rating on the site. There is a slight worry amongst users due to the knife’s rather pointy tp. However, it is a well-balanced tool where the positives definitely outweigh the negatives. Customers have also described this as an upgrade over their Swiss army knives. The knife is compact and fits in to the hand very easily. The handles really do not have contours on both sides rather they are actually flat. In conclusion, the product is everything you would want in a good quality knife. It is razor sharp- 420HC steel blade. It is stylish and it is compact. The versatility makes it a tool that can be carried anywhere and used for myriad purposes.